It’s Friday, February 20 and we are in the depths of the bear market of 2009 in the US. 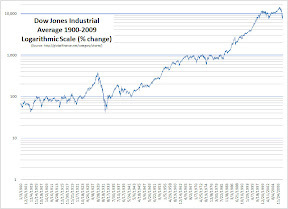 Here at Global Finance Net Blog, that means it is time to publish our Dow Charts once again. 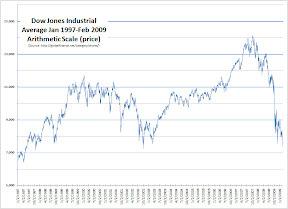 You can read our earlier post on Dow charts for some explanation of the charts as well as links on the difference between logarithmic charts and arithmetic charts. We also did a post earlier today on the Dow 30 components and their weightings (a little insight on how the modern day Dow is calculated). Keep in mind that the 1997-2009 chart is an arithmetic chart, not a logarithmic chart so there is some distortion in the price movements. But, for illustrative purposes it makes the point that we are back where we were 12 years ago.